Turbine flowmeters are displacement devices which mechanically measure fluid flow, specifically clean liquids and gases. Turbine flowmeters, so named for the axially mounted turbine these measuring instruments employ, measure the velocity of fluids flowing through the instrument. Additional processing of the fluid velocity measurement can be used to determine volumetric and mass flow. 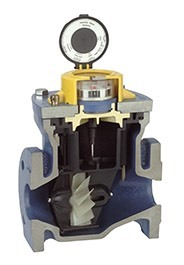 In a single turbine flowmeter, there is a paramagnetic bladed turbine rotator which spins proportionally to the velocity of the subject fluid flowing through the pipe. Directly above the rotator and isolated from the fluid is a pickup coil, comprised of fine wire windings and a magnet. As the fluid flows and makes the suspended rotator spin, the rotator blades pass through the magnetic field of the pickup coil, generating a sinusoidal electrical signal. This signal is processed into a final calculation of total metered volume, as well as instantaneous flow rate and mass flow, based on the counts of turbine blade passage. Known for their accuracy and comparatively large turndown ratio, turbine flowmeters also accommodate a wide range of temperature and pressure combinations. Little maintenance is required and installation is generally simple to accomplish. Use of turbine flowmeters should be avoided with corrosive fluids, as well as those with high viscosity. Adequate protection, in the form of a properly sized strainer, should be provided upstream of the device. The mechanical nature of the turbine requires the support bearings to remain lubricated and in a condition that does not impede the movement of the rotor, as this would result in a reading below the actual flow rate. When applied with liquids, operators must assure that the entire cross section of the pipe in the measuring section is filled with the measured liquid. 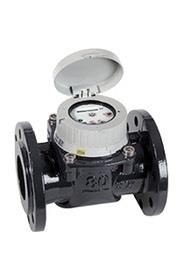 Turbine flowmeters advantages additionally include low pressure drop and a compact design. Available sizes and materials of construction can accommodate a wide variety of applications in oil and gas, wastewater, utility, chemical, and food and beverage industries. Proper instrument selection and configuration goes hand in hand with a proper installation toward successful project completion. Share your fluid measurement challenges with instrumentation specialists, combining your process knowledge with their product application expertise to develop effective solutions.